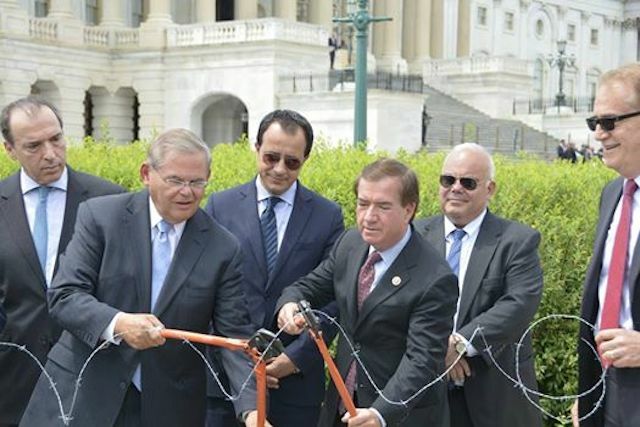 U.S. Sen. Robert Menendez (D-NJ), Chairman of the Senate Foreign Relations Committee, and U.S. Rep. Ed Royce (R-CA), Chairman of the House Foreign Affairs Committee, wrote President Obama urging the Administration to increase attention to the goal of reunifying Cyprus. At the press conference on the steps of the U.S. Capitol, the two high ranking Senators cut barbed wire, to symbolize reunification efforts and to send a message that 40 years of division was enough. An EU Member, Cyprus has proven itself to be a reliable partner to the United States, including in counterterrorism and nonproliferation efforts. Reunification would allow Cyprus to fully realize its potential as a stable and predictable democracy and a regional leader anchored in the western security architecture that is capable of bolstering European energy security. As reunification can only come from sincere negotiations between the island’s communities, we believe that the United States has a critical role to play in supporting the negotiating process that resumed earlier this year. It is also clear that reunification is not possible without Turkey’s support. Turkey must engage in a meaningful and constructive dialogue to address core issues such as the full and permanent withdrawal of its military forces, territorial adjustments, property issues and settlers. Since the Turkish invasion in 1974, the U.S. has supported a solution in accordance with U.N. Security Council Resolutions that provide for the establishment of a bi-zonal, bi-communal federation with a single sovereignty, a single international personality and a single citizenship. In our roles in Congress we will work to support efforts to reach a solution that will restore peace on the island. We urge you to likewise enhance U.S. support for the reunification efforts and look forward to working with you to end these 40 long years of unjust and undeserved division. Wow, 40 yrs! How can we ever forget! Why do I get the feeling that this is overreaching? (The US never does that, of course…) Or just poking a hornet’s nest to see what will happen? Cyprus is a complicated question, and I wonder how much of this is rooted in the fact that they also owe the ECB a good 50 Billion? A country w/ less than half a million people owing 50 billion. Think on that a bit. No, it is not downtown Dubai from tip to stern. It is an humble, mostly agricultural and tourist-based island. Where did the money go? ECB provides boomerang cash, visiting ever-so-briefly a few aristocratic pockets, then returning to Them What Lent It. So Cyprus. Free yourselves. Asking the US or EU to negotiate this is (more) golden handcuffs.